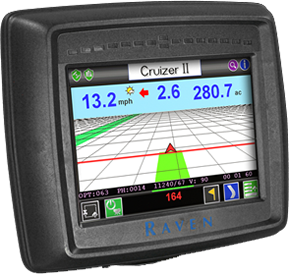 Raven Cruizer II™ & Cruizer II™ RTK let you add all the benefits of an easy-to-use precision guidance system and more to your operation, without pushing your budget off course. Because we removed two of the biggest obstacles—complexity and high cost. Cruizer II & Cruizer II RTK also make it simple for you to grow with more power and capability when you’re ready for auto-steering and automatic on-off planter and boom section controls. Use Slingshot® with Cruizer II™ RTK to turbo-charge your precision ag equipment software. You get unrivaled high-speed wireless connectivity, cellular-enabled technology, uninterrupted signals/data transfer, industry-leading wireless RTK connections and vehicle tracking. Slingshot® also gives you access to live remote support from Raven’s team of experts.